Potato Cheese Soup is awesome. No kidding. 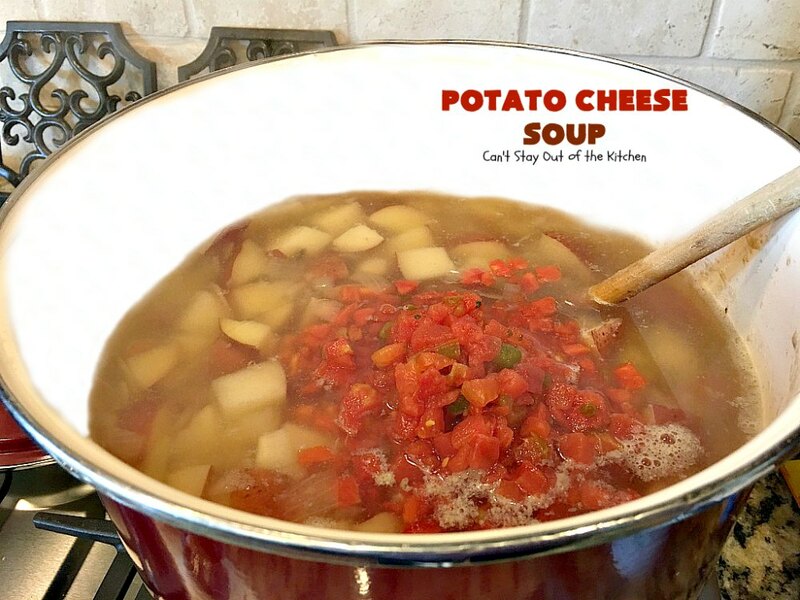 It’s filled with red potatoes, diced tomatoes with green chilies (yum! 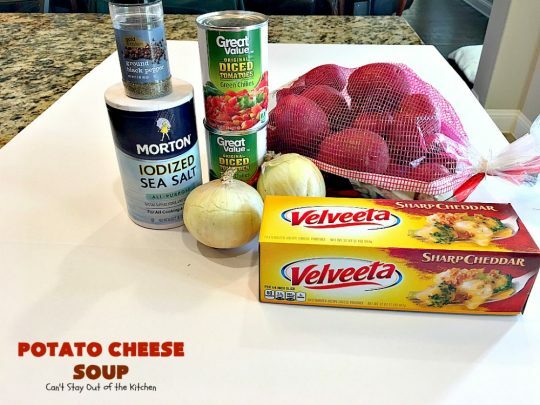 ), onion and Velveeta cheese. 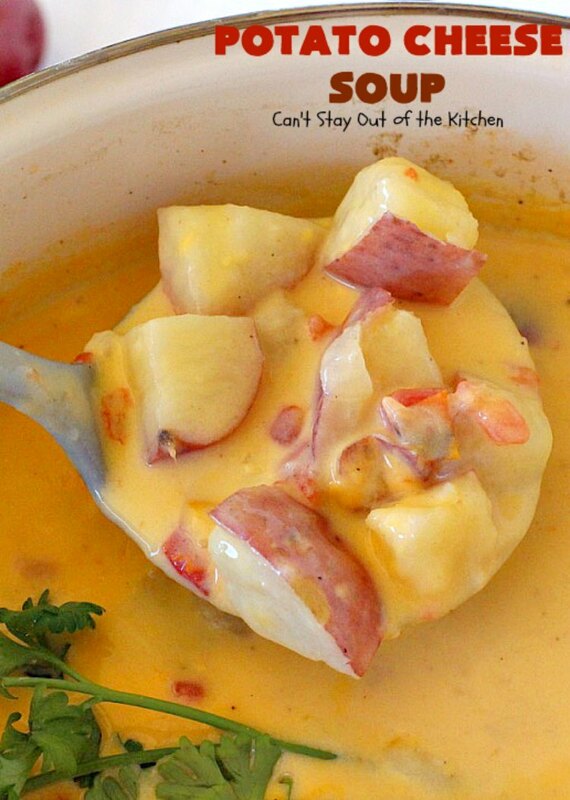 I know, Velveeta isn’t the healthiest cheese on the block but it sure works splendidly with this recipe. Every time I serve this recipe to company, people go back for multiple servings. Really. Years ago, our former pastor’s wife gave me several delicious soup recipes including The Dove’s Nest Fresh Squash and Cheese Soup, White Chicken Chili, this one and a couple more. I’ve made this super easy Potato Cheese Soup for company many times because it only calls for a handful of ingredients and everyone always salivates over it. Seriously. Velveeta makes everything better, plus how can you live without a can of diced tomatoes with green chilies added to everything???? About the middle of January I hosted our Bible Study Fellowship group at my home. I served Potato Cheese Soup along with a Cauliflower Cheese Soup, Mississippi Mud Brownies (which everyone drooled over), Be My Valentine M&M Cookies, Creamy Grape Salad, Broccoli, Pear and Pomegranate Salad, Spinach Pomegranate Salad and a loaf of my Rapid Rise Italian Herb Bread (which is always a favorite). I made double batches of several things so the gals could take home leftovers. My intention was to pamper each of them with a delicious and fun meal. 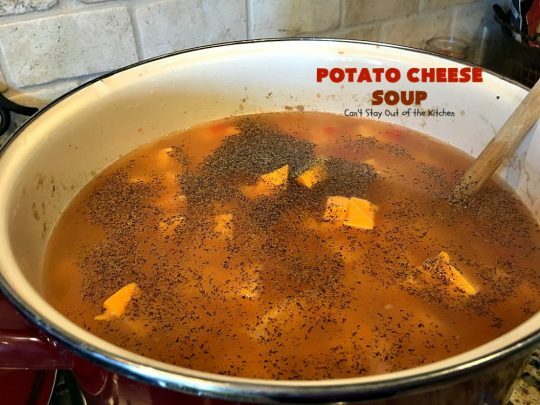 This soup was a huge hit. Everyone wanted to take home the leftovers. 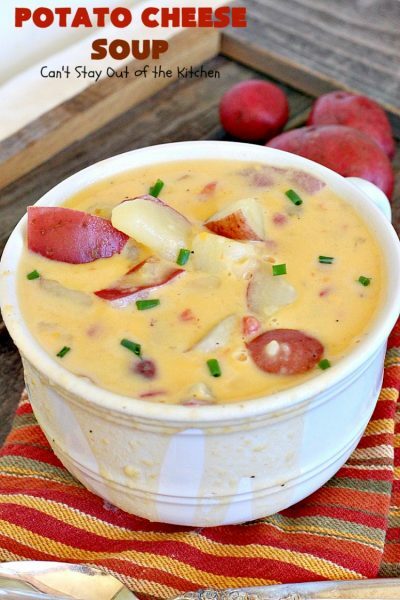 If you’re looking for great comfort food the next time you’re working on your weekly menu plan, give Potato Cheese Soup a try. You’ll be so glad you did. 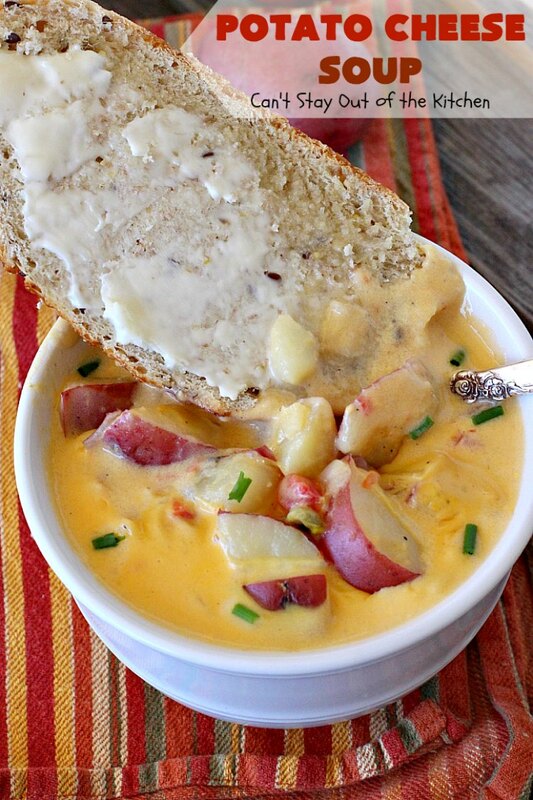 Potato Cheese Soup is awesome–especially if you want to dip your bread into it! 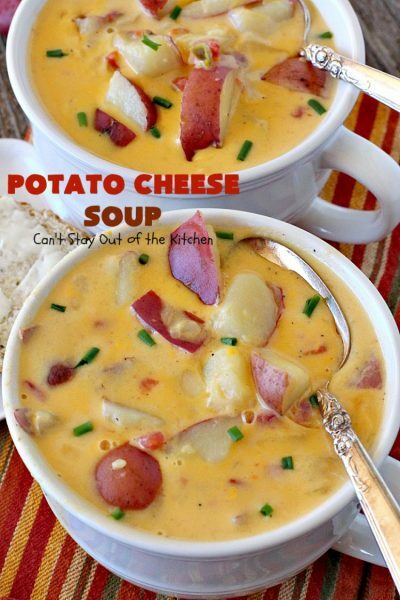 This is a great soup to serve at a Super Bowl party! That is, in case you want some real food! Serve Potato Cheese Soup with your favorite bread and you have a very filling and satisfying meal! I used these ingredients. I actually ended up making a double batch. Scrub potatoes and cube. Place in a large stock pot and fill to the potato line with water. Add chopped onions. 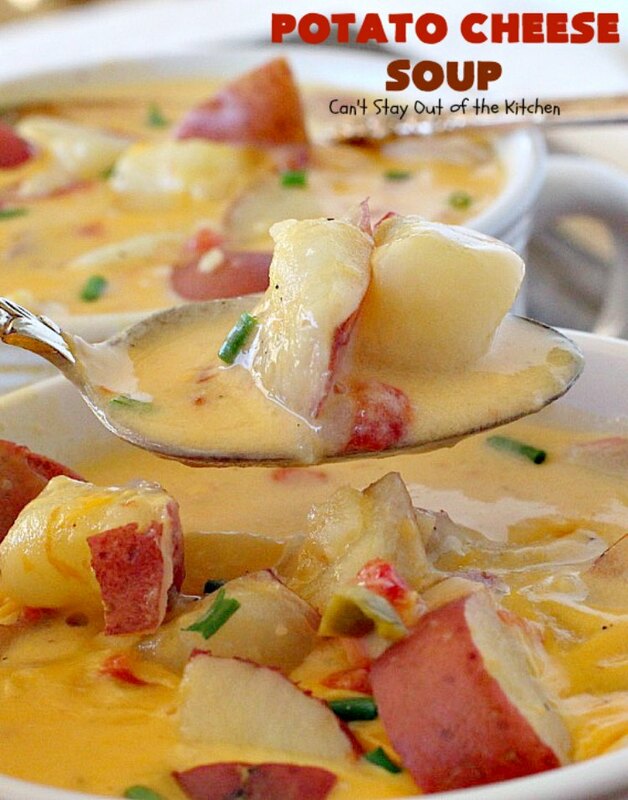 Cook until potatoes are tender, but NOT mushy. If you’re using red potatoes, don’t peel the potato skins. Add undrained diced tomatoes with green chilies. Stir to combine and heat through. DO NOT remove any of the water. Cut Velveeta cheese into cubes. Add cheese, salt and pepper and continue stirring over low heat until cheese melts completely. Serve soup garnished with parsley or freshly snipped chives, if desired. 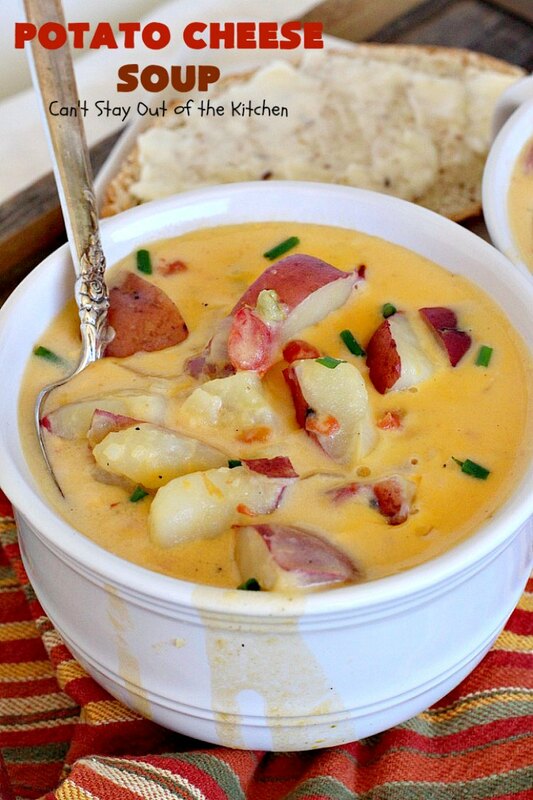 This soup is the ultimate! It’s filled with potatoes and cheese with just a touch of heat from the green chilies. 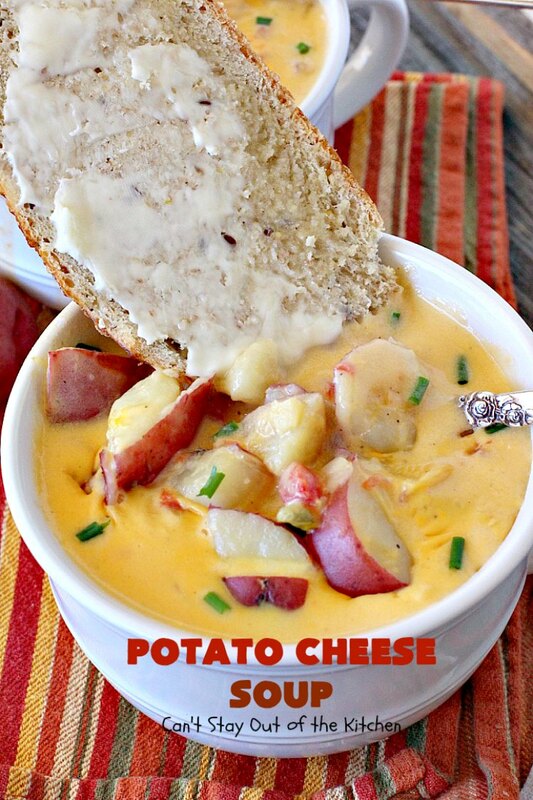 It’s perfect for cold, winter nights when you’re desiring hot food to eat. Potato Cheese Soup is also excellent reheated–if you have any leftovers! 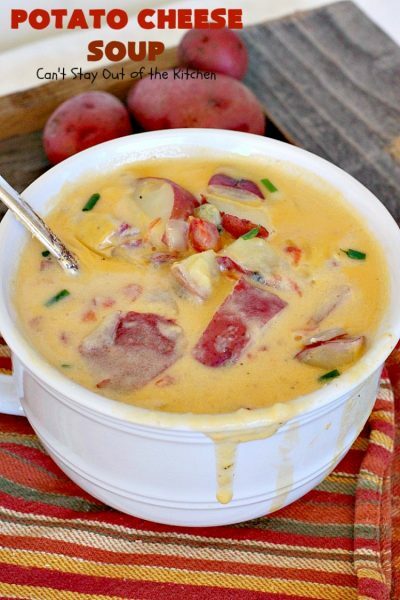 Every bite of Potato Cheese Soup will have you salivating! This is such wonderful comfort food. This amazing soup is the ultimate in comfort food! It uses red potatoes, onions, diced tomatoes with green chilies and Velveeta cheese. Quick, easy & gluten free. 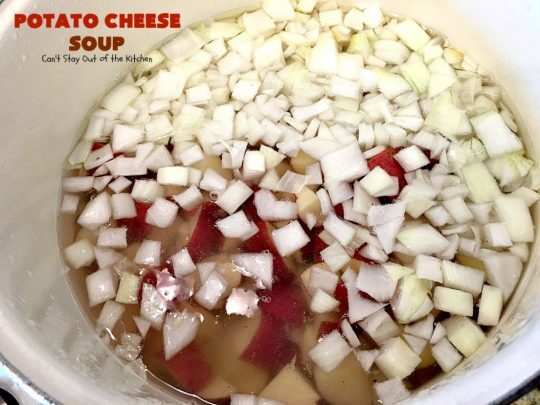 Place potatoes and onions in a large pot. Cook until tender, but not mushy. Add one can of Rotel tomatoes and chilies. Add salt and pepper to taste. DO NOT DRAIN. 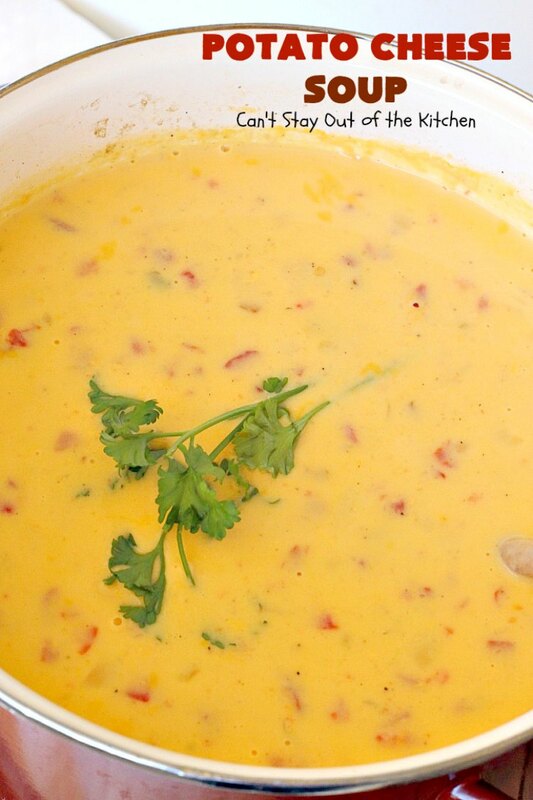 Then add approximately one pound of Velveeta cheese, cut up into small chunks. (I used 1 1/2 lbs. cubed Velveeta). Cook until melted, stirring to keep from scorching. That's all there is to it! Good with cornbread or just like it is! NOTE: If using red potatoes, don’t peel. NOTE: Rotel is a specific brand for diced tomatoes and green chilies. It is very popular in Texas. 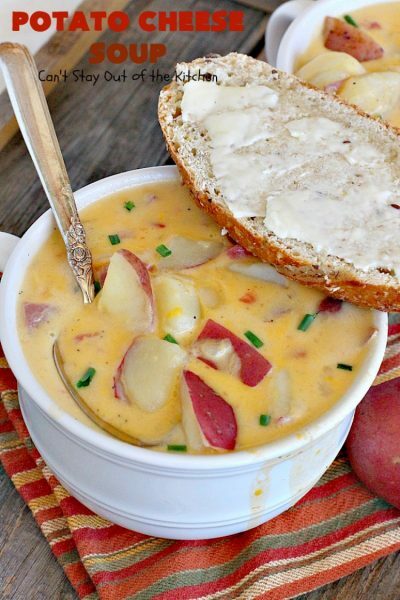 If you enjoy dunking bread into your soups, this is the perfect recipe to do that! While you can make this soup with regular potatoes, I prefer making it with red potatoes. Give this soup a try the next time you have company. Everyone will rave over it!